Page F30: Well, I'll be. Looks like flowing water on Mars. Well, I'll be. 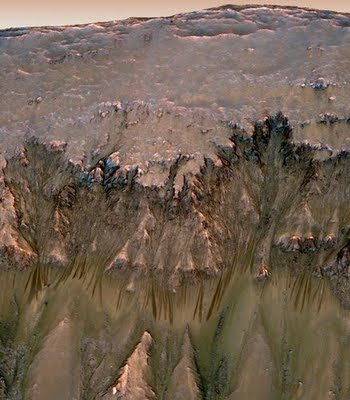 Looks like flowing water on Mars. Today's big news in space is this, on Mars. I like the quote at the beginning of this article in particular, as it mentions that this is certainly the umpteenth time the words water and Mars have appeared in a recent news article. The type of water we're talking about makes a big difference though: there's ice water underground, ice water on the surface, and then there's flowing water on the surface. The last is what appears to be found, or at least thawing water on the surface that shows up in the summer. Such water would have to be salty due to the lower freezing point (i.e. salty water can be in liquid form at colder temperatures). Flowing water is also a much stronger indication of possible life than permanently frozen water. For information about the discovery itself, see that article or this one or this one or any others in the news today. What I would like to reiterate here however is my stance as a moon-first proponent: while the moon is clearly the best destination for manned exploration (three days' journey away, no launch windows, landing is easy, has water, many other nations can help out, etc. ), this comes with a qualifier: this is assuming our current levels of funding and interest for manned exploration and colonization. In other words, if you only have $20 to put away per week on travel then I would recommend a weekend in the mountains over a summer-long cruise ship trip, even though the latter would certainly be more fun if you were willing to put the money away to make it happen. In the same way, if the world were to one day suddenly decide that Mars is the place to be, and is willing to quadruple (for example) the current money spent on space to make it happen, then by all means let's go to Mars.